You will use Excel templates when you want to export metadata from your SharePoint to an Excel file. You will add content controls/placeholders to the template so that JungleDocs knows where to place the metadata. What does an Excel template look like? JungleDocs needs to know where exactly to place the data from your SharePoint in your Excel template. To let JungleDocs fill your Excel document correctly, you will add content controls (placeholders) to the template. Document templates consist of both static content and dynamic content. Static content is content that is always there and does not change. Dynamic content is that what changes for each version of a document. Dynamic content exists of the parts of a document that get filled in later and different for each document. 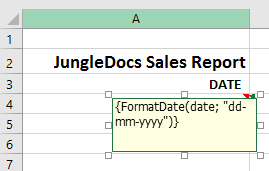 In the image below the dynamic content was automatically added to the Excel template by using JungleDocs 365. How to add dynamic content to a static Excel template? 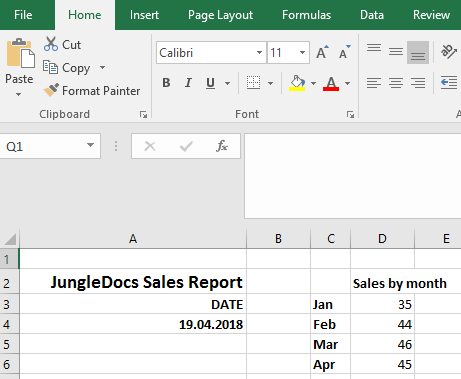 To let JungleDocs for Office 365 add dynamic content into a static Excel template you will need to add content controls to it. You will enter a formula or column/list name in each content control, this will tell JungleDocs from which SharePoint list to gather the data. In the below images you can see the two ways in which content controls can be added to a template. Note: read more about content controls and how to use them in the below section. How to configure an Excel template? Using this first method you simply enter the values into the cells that will later be replaced by data from your SharePoint. This is the quicker and simpler method of the two. However, note that documents created in this way will not be updateable once generated. Note: if you plan on using Update Document Content functionality, we recommend using the second method of using comments described below. Note: after figuring out the layout and exact cells in the document, it is very important to format the cells correctly. Microsoft Excel requires that the cell type is consistent with the data that that is inserted. 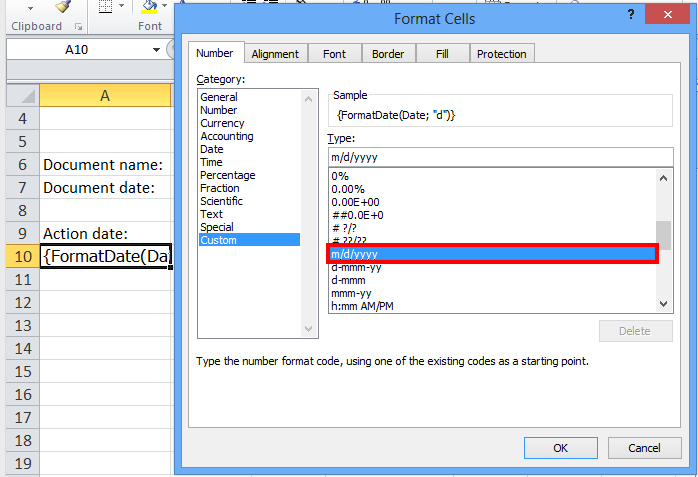 Default cell type is General and if all cells are left this way, some data, like dates and numbers, might not be interpreted correctly. To avoid this, Excel cells must be the same type as SharePoint fields. You can change the cell types by right-clicking on them and selecting Format cells. Add a comment to the cell you want to be populated with metadata from your SharePoint. Remove the user's name from the comment and add your formula. How to add Excel templates to JungleDocs rules? 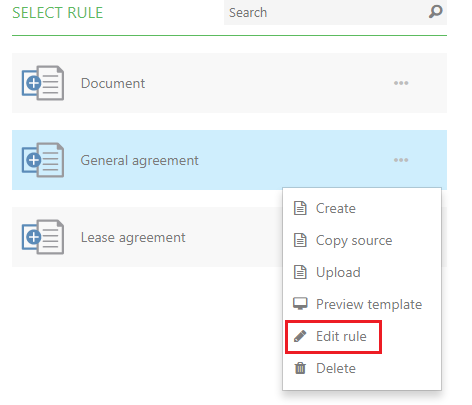 You can either modify an existing rule by editing an assigned template or you can add a template when you create a new rule. To modify existing document templates, navigate to the source list/library that you will use to create your documents and reports and launch JungleDocs 365. Now select the rule you want to edit the template for. Click on the drop-down menu arrow and click Edit rule. Now select Edit document template. This will prompt the template to open in Excel. 1. To modify a template when creating a rule, start by creating the rule. Then when configuring the rule you can select a Custom template to upload a new template or select Edit template to edit the existing one.